I once had a horse named Danny, the best horse I ever had. He was smart, hardworking, and loyal. He became my best friend and workmate. Danny listened to me late at night as I talked to him in his stall, never passing judgment, always being there for me. We worked hard together to move logs, rocks, and maple sap. He taught me to have confidence and discipline and to trust the unspoken language between humans and animals. Danny was important to my growing up and finding myself. He became a cornerstone of my life. The 1970s were a time when my husband, Bob, and I were young and searching for who we were in the world. After working at factory jobs and spending our weekends camping deep in the woods, we decided we wanted a different lifestyle. The back-to-the-land movement talked of a simpler, self-sufficient way of life and that appealed to us. Bob was a good carpenter and wanted to work for himself. We were both opposed to the Vietnam War and as the war raged on, we found solace in the forest. I wanted to live in the woods all the time, paint landscapes, and work with horses. 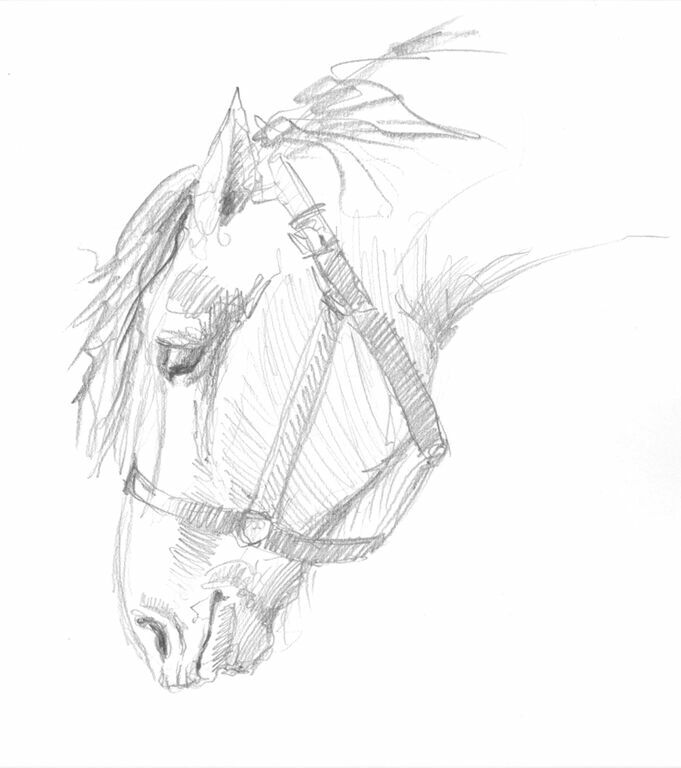 My great grandmother, Mary Ida – we called her Nana – had many horses, including Percherons. These heavy draft horses were the common “tractors” of the nineteenth and early twentieth centuries. Nana had fancier horses that she showed at horse shows but the Percherons had done the work on her farm in years past. She had a tractor too that her farmhand used to make hay which was fed to her horses, cattle, chickens, hogs, and many goats. On Sundays all six of us kids visited Nana in our Sunday best clothes. One by one we sat in a small chair next to Nana in her parlor and told her what we had done in school and any other news from that week. After our formal tea we were then allowed to change into jeans and boots. We would burst out the back door to see the horses and explore the fields of Nana’s farm. Nana would change and come out to the fields too. She stood at the top gate and whistled for her horses. All seven thundered up the hill and stopped five inches from her, while we all ran for the fence. Nana gave each horse a mint and petted them. When she passed away I was seven and our family moved to her Meadow View Farm; it had a long view down a gentle slope to the Connecticut River two miles away. All the horses had been sold but my dad tried to keep the fields hayed. I remember riding on that old 1920 Farmall tractor with him. The hay equipment always broke just when it was about to rain. The pressure of running his business and keeping the ancient haying equipment in repair pushed him to give up on the haying after a couple of years. Dad continued to keep the fields cut once a year but no more baled hay came from our land. As a child I spent a lot of time roaming the big pine woods surrounding our old house.When we moved to my great grandmother’s farm, we played in the woods and fields there. I found peace and solitude there. Nana started my love of horses and of being with them. 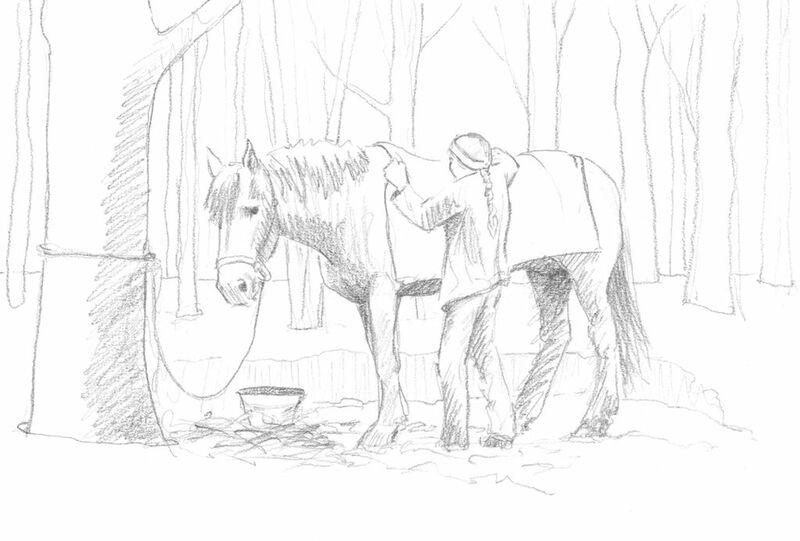 That grew into a dream to live in the woods and work the land with horses. At the age of 20 I was going to the University of Massachusetts as an art major, with a minor in animal science. I learned to harness and drive horses from Bernie Tilton at the University horse barns and refined my riding skills in the horse management classes. We were quickly running out of the money my grandmother had given me for school and I wanted to invest what we had left in land. The carpentry contractor my husband was working for went out of business, which tipped the balance. Now he was looking for new work, and the idea of living off the land and being his own boss seemed like a good idea to him. We had looked at many pieces of land and finally found 107 acres in Winchester, New Hampshire. We put all the money we had as down payment and got a bank loan for the rest. The land cost was low because it was “back land.” Also known as “landlocked,” it is land that has to cross other people’s land to reach a town road. Our new land was a wood lot that started one and a half miles from the town dirt road. There was a high plateau of forty-five acres on the western side that let into a small gorge with a year- round stream that came from a swamp to the north. Across the stream the land rose steeply to a high knoll where you could see the Connecticut River. It was so beautiful, we knew it would be hard work but worth it to live in such a place. We finally signed the papers in the end of February of 1975 and gave notice to our landlord that we were moving out of our apartment. We were living in Belchertown, Massachusetts, over an hour south of Winchester. There was no snow on the ground there, Spring had arrived in Belchertown. Next to our apartment in Belchertown we had an elderly neighbor, Alice Sum, who kept a two-acre vegetable and flower garden. She sold her produce at a farm stand in front of her house. She had become a good friend and taught me a lot about gardening. Alice knew about our new land and called me over for tea one day. She said, “I have to show you something out in my back shed.” We walked out back of her house where she opened the door to her shed. 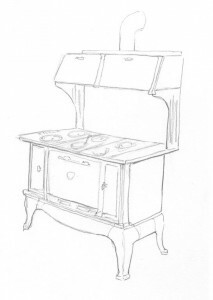 There stood the most beautiful cream and light green enamel wood cookstove. Alice said “I’ve been offered five hundred dollars for it but for you, I’ll sell it for sixty.” I argued that she should get the money for it. We could make do. But she said, “No, I know you like it and you’ll need it up there in the woods. I want you to have it because I’ll miss you.” We hugged on the deal. 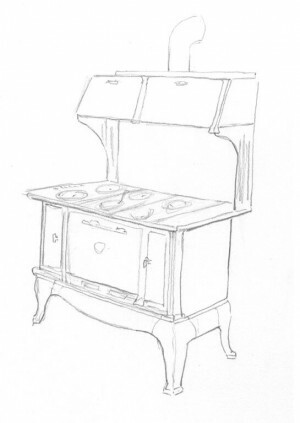 There stood the most beautiful and light green enamel wood cookstove. We moved out by stacking everything we owned on our big, eighteen-foot flat bed 1959 Dodge truck that Bob had bought and fixed up for working the land. We also had a 1966 Dodge panel truck, kind of like an early van. The first thing to be loaded onto the truck was that cookstove, packed with blankets and ropes, then our furniture and boxes of belongings. Up to New Hampshire we roared, only to find over a foot and a half of snow at the beginning of the road to our land. We stopped dead. There was no way we could drive in. It dawned on us then that it was March 1st and the weather here was very different from Belchertown. We had to do some quick work to continue on our plan. We parked the big truck on the right-of-way road and put a tarp over all our stuff from the apartment. Then we went looking in our van truck to find a draft horse that could pull everything into the building sight a mile and a half into the woods. While we were waiting to close on the land deal, we had looked for affordable tractors. We didn’t find any that were four-wheel drive, powerful enough to pull logs, and within our budget. 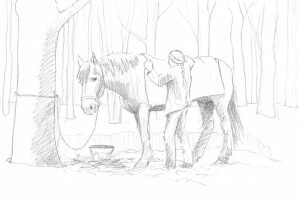 We needed a horse quickly so that we could pull our building supplies and belongings into the land. Over the past few months I had looked at ten or more horses, but all the beautiful, well-trained horses I found were way beyond our means. Mr. O’Connel called his barn manager and had him show us to the barn. 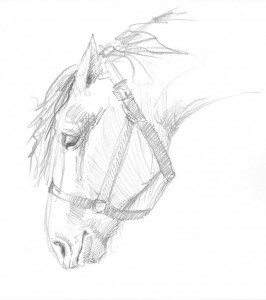 When we got to the dark stall where he was tied, we saw a u-necked, splay-footed, skinny Percheron with big cracks in his long hooves. Percherons are a breed of workhorse from France that were once the most common workhorses in America before tractors took over their work. They usually are grey or black but some are brown. This horse was a brown bay with black legs, mane, tail, and a brown body. 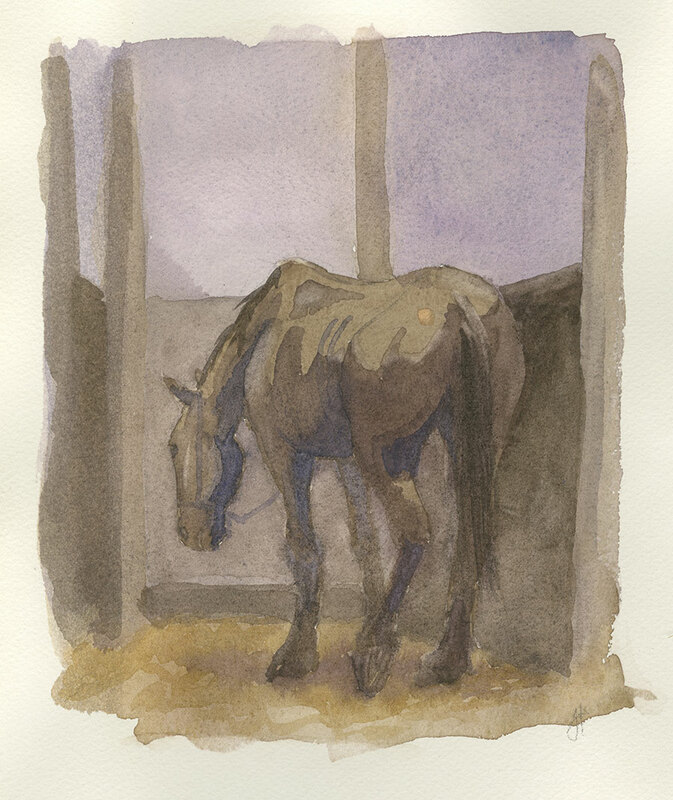 He hung his head and looked very sad in that small stall in the back of the barn. This was a bag of bones, not the full-weight, muscled draft horses that I remembered my Nana had kept. He hung his head and looked very sad. The name Danny is commonly given to draft horses. It’s easy to give a command to a short name. 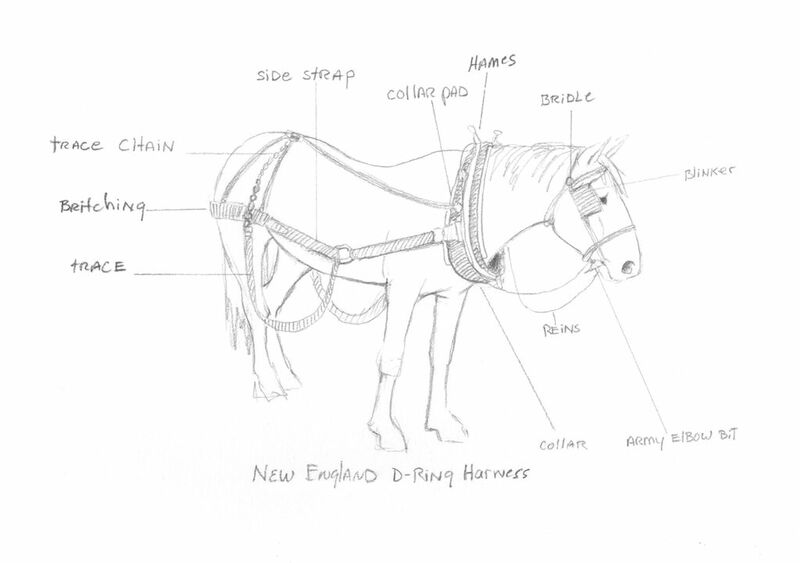 Pretty soon, Danny would embody everything I thought of when I thought of a good draft horse. Jenny and I sat on the logging sled while the manager put the harness on the old horse. When he drove Danny out of the barn, Dan arched his neck and pranced out proudly, the manager hardly able to keep Danny reined in. He hitched Danny to the sled with Jenny and me still sitting on it. Dan picked up his head and put all he had into pulling that sled. 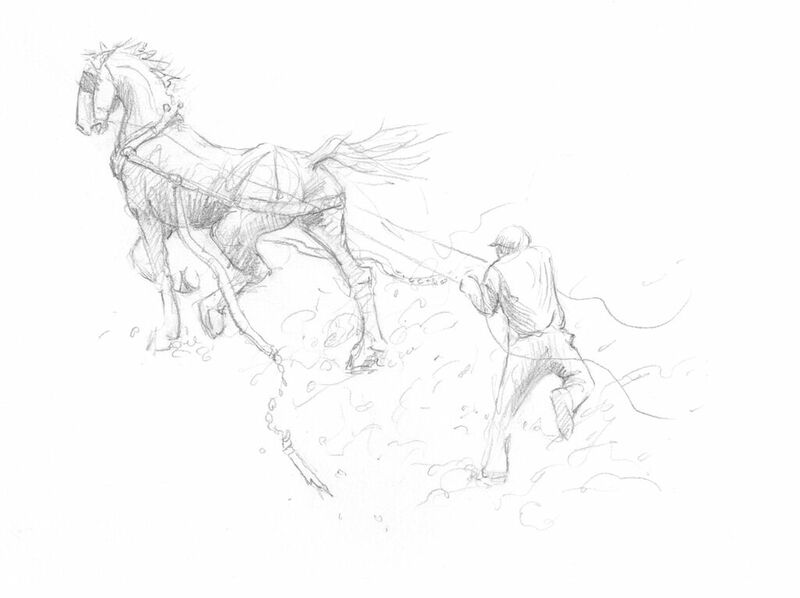 As he threw himself into the load, the whipple tree (the cross piece that the harness chains hook to) broke and Danny went trotting off down the road with the manager running behind him. I said to Jenny, “If he has that much strength and spirit all he needs is to fatten up and then imagine what he could pull.” Jenny agreed. The manager and Dan came back and I said, “O.K., load him up.” While they loaded Danny in a horse-hauling truck to drive us to New Hampshire, I went back to the office and paid A.C. the meat price of $320 plus fifty dollars for shipping Dan to Winchester. Danny loaded easily in the large box truck – the manager could have put five more horses in there. I followed in my truck as we wove our way on snowy back roads across Massachusetts. We arrived at the logging road to our land in Winchester, at dusk. The manager unloaded Dan down a ramp. Once on the ground Danny pranced around in circles and pawed the ground. He hadn’t been out of that dark stall in a long time. The barn manager wished us luck and left. I tied Danny to a tree and gave him some hay which he dove his teeth into. We were both nervous about our new purchase. Bob didn’t know much about horses and was counting on me to make the right decisions about our new “piece of equipment” for working the land. Bob would have preferred a tractor if we could afford one. We looked Danny over, counted his ribs, inspected his untrimmed, cracked hooves and noticed his too-long head and very long ears. He had a thick, dark brown winter coat, but his big brown eyes were his best feature, calm and kind. Dan arched is neck and pranced out proudly. I didn’t have a harness or bridle for him yet but I wanted to ride Dan to see what he was like. I used rope for reins, tied to his halter, and loosened the halter so it hung down his nose a bit. This gave me a little more control on his nose like a bosal (a bosal is a South American nose band that presses on the lower nose instead of reining with a bit). Bob gave me a boost up to his back. I turned Danny up the logging road and he took off at a canter. He gave out a little side kick as he went. I could feel how happy he was to be out of that stall and running through the woods. Like most draft horses, Danny had never been ridden much, so he didn’t know the usual leg signals that riders give. He knew voice commands like gee for right, haw for left, back, step up and whoa. After a mile or so I told him to walk and then called out “Gee, Gee” (turn right). 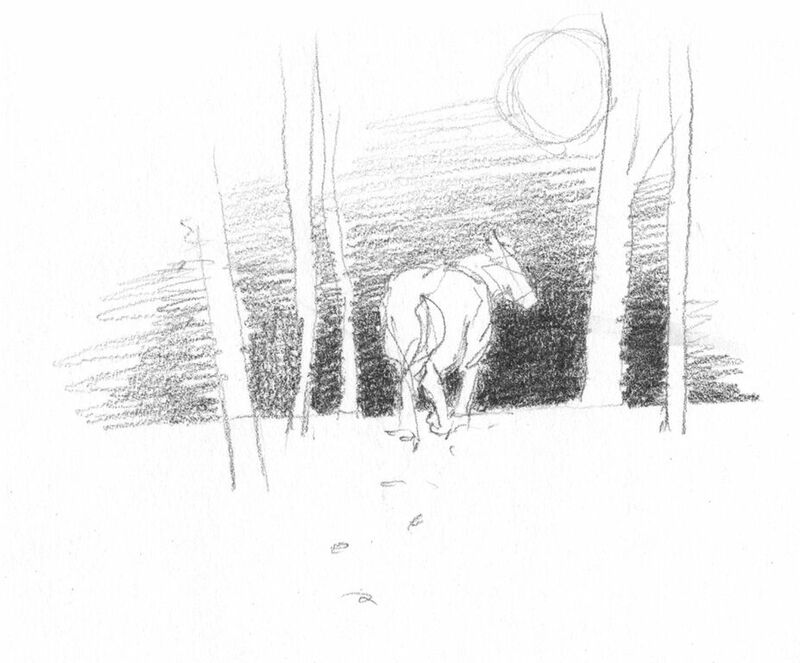 With much effort, I turned him around and trotted back to the camp site. I did short pulls on the reins and called out, “Ease up!” Danny slowed to a walk, but seemed to want to keep going to the town road. As I was yelling, “Whoa,” Bob stepped into the road and held up his hands and Danny stopped. We tied Dan back to the tree at our camp site and put a blanket on him. Then Bob and I went to the stream to get him a bucket of water. We gave Dan more hay and a bucket of grain which he ate like he had never eaten before. Bob and I cooked a dinner of hot dogs and beans over a camp fire and listened to Dan’s munching. “Where do we get a harness?” Bob asked, his voice full of concern. We were tired so we gave Dan extra hay and water for the night and checked his blanket, just a regular blanket tied on with rope. Then we crawled into the back of our panel truck where we had a camping mattress and sleeping bags. We checked his blanket, just a regular blanket tied on with a rope. The full moon came up over bitter cold hills. It was so cold that night (we later learned it was ten below zero), we slept in our truck with three sleeping bags on top of us. As the moon rose, the temperature dropped. I awoke to hear crunch, crunch, crunch, Dan’s footsteps in the snow, and saw a large dark shape go by the window of the truck. I tried to put on my boots but they were frozen with the tops bent over. It took several minutes to get them on along with my coat. When we jumped out and checked the tree all we saw was a slack rope and a halter. The halter Danny came with was rotten underneath and had broken. Bob and I ran through the dark blue woods in the moonlight trying to catch up with Dan. We could hear him crunching through the shining, ice-covered snow but he was always just ahead of us. After four hours of searching we finally gave up and went back to the truck to sleep. I lay awake worrying about Dan. Danny is lost in the night. At dawn we kindled a fire, then made coffee to warm up and then went back to searching. I went down the hill to where there were farmhouses and stopped at each house, asking if anyone had seen a large brown horse. No one had. I went up to the top of the mountain, as horses usually go uphill when lost or scared. Near the top I stopped at the last old farmhouse and knocked on the kitchen door. A woman about my age opened the door. “Have you seen a big brown work horse?” I asked. She shook her head and said, “If there were a horse up here, I would have seen him.” There were open fields around her house and a panoramic view. I told her how to find us if she saw the horse and she said she would come get us if the horse showed up. I went back to the camp site, feeling discouraged and fearful for Danny. He must be scared since he had never been in these woods. 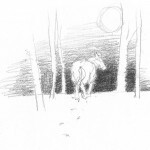 Coyotes might attack an old horse or someone could steal him. If he made it to the main road, he could get hit by a car. My stomach churned and I felt shaky with fear for Danny. While we talked about what to do next, a green Volkswagen beetle came up the woods road. It was the woman, Edie, from the old farmhouse at top of the mountain and that is how I met a lifelong friend. She had seen Danny pawing at the snow to dig down to reach grass in her field. We jumped in the truck and sped to the mountain. Dan wasn’t at her house anymore so we went up to the peak of the mountain where the road ended. There was Dan, eating grass on a small piece of exposed field with three kids around him. They were on a walk with their mother and were so excited to find a big horse. They giggled and fed him the candy they had in their pockets. Dan seemed to like the kids and was calm as I walked up and put a rope around his neck. The kids and Bob petted Dan as I made a rope halter (a trick Bernie had taught me). Then we walked Dan the three miles back to our camp site, so happy that he was safe again. While I drove to Belchertown to get the harness, Bob stayed with Dan and worked on the sled we would need to move our cabin lumber in to the building site. Once I got back I looked the harness over and cleaned it with neatsfoot oil and a rag. As I worked I realized the hundred-year-old harness needed some repair. The traces (the long leather straps that go from the collar to the load) were pealing apart. I didn’t have a needle and awl big enough to go through the thick harness leather so I used a hand drill to go through the inch-thick leather. Then I used fencing wire to loop through the holes and bind the layers of leather together. I used pliers to twist the ends of the wires and smooth them down. It wasn’t pretty but those repairs held together for many years. especially worried about. The work ahead of Danny was a very hard pull uphill through a foot of snow with a foot of spring mud beneath it. Now it was time to harness Danny. Dan and I were both new to each other and nervous. I prayed that A.C. O’Connel had been somewhat truthful. You never know with horse traders. First I slid the collar upside down over his head and turned it into place on his shoulders. It fit well. I took the bridle over to him and slipped the bit in his mouth. It seemed to be the right size but the bridle needed adjustments for that long head of his. He stayed calm and let me fiddle with the buckles. Next came the harness. I let Dan smell it and look at it. Then I touched it to his side. He stood still. I hoisted it up over my shoulder and swung it up over his back. Dan danced sideways and the harness landed in the snow. He looked down at it, white-eyed and snorting. So I went through the steps again of letting him smell and look and touch again, all the while petting him. The second time I slung the harness up, he stepped sideways only one step and the harness made it to his back. I petted him to calm him down and then buckled the hames (the two curved pieces of wood with brass knobs on the top ends that fit onto the collar). It took almost an hour to adjust all the straps on the britching or back half of the harness, but Dan stood still for all of it. I even think he enjoyed the attention.